In Australia we definitely have our fair share of invasive species and the main problem is that we are such a huge land mass with such a small population. The population of Australia is concentrated mainly around the city areas along the coast and many invasive species have been able to spread with ease. 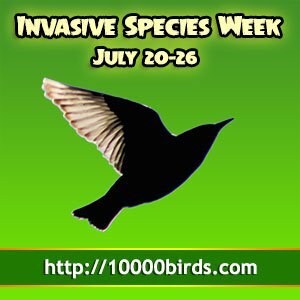 A lot of the invasive species that we have nowadays are species that were brought into the country in very small numbers a long time ago and generally in good faith. European Red Foxes were brought into Australia in the 1850’s for recreational hunting and soon spread rapidly. They are now all over Australia, though in smaller numbers in Tasmania and in the north of Australia. They have occasionally been seen to the south of Broome, but as yet have not become a big problem. Both climate and terrain will keep some invasive species out of the northern part of Australia. There are wild dogs present and these are not the dingo, but a dog that was also brought to Australia by Europeans in 1788 and has spread throughout the country. Feral cats have been able to adapt very well in Australia and have grown larger over the years and can survive in areas that you would not expect. 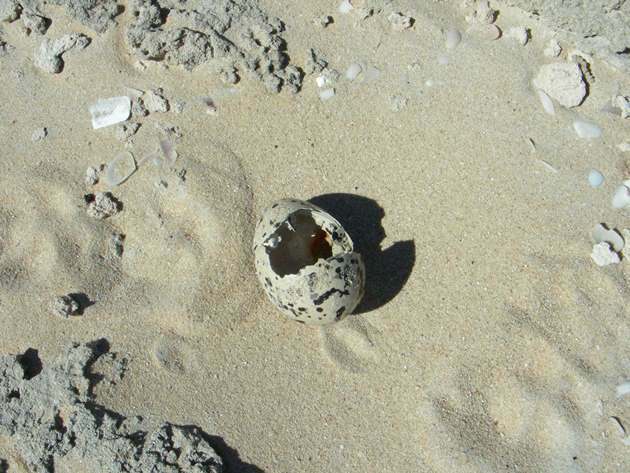 We have seen them on remote beaches hunting shorebirds and taking their eggs and they have been responsible for much of the egg loss in breeding Pied Oystercatchers along the Broome coast. They are incredibly cunning and not easily trapped. 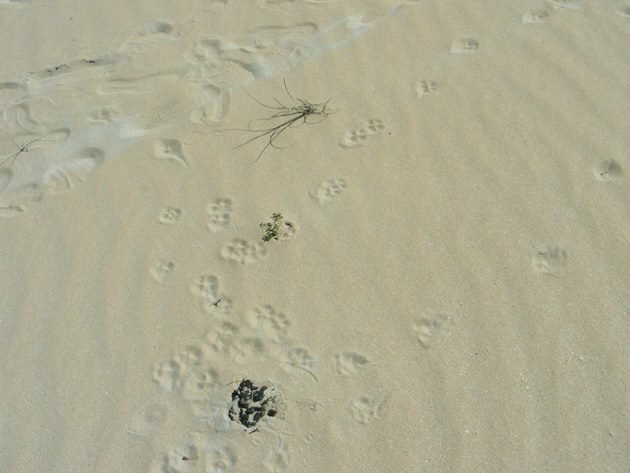 The feral cats were thought to have arrived as pets during early European settlement and then more were introduced to control rabbits and rodents, but now they inhabit all of Australia including offshore islands and are responsible for a high percentage of native species loss. The European Rabbit was also introduced for hunting by early settlers and it soon bred and became highly invasive. The main threat was the reduction in vegetation for native animals and the general degradation of the land. In recent years there have been introduced viruses to control the rabbit and the population has diminished, but still needs to be controlled. Feral Goats also arrived with the first European settlers and this species population fluctuates dramatically depending on climatic conditions. Like the European Rabbit they degrade the soil and eat the vegetation and need to be controlled. The First Fleet were also responsible for the arrival of pigs that have become feral and inhabit approximately 40% of Australia and cause competition for water and generally damage all pasture. Invasive species in Australia are not just land based, but waterways are at threat from European Carp that were introduced and then subsequent flooding of the Murray/Darling Basin enabled them to spread far and wide. On top of these species there are invasive plants and fungus and we have a lot to be concerned about in Australia in a land that is incredibly large with a very small population. We are lucky in Broome that due to our remoteness we rarely get invasive bird species. 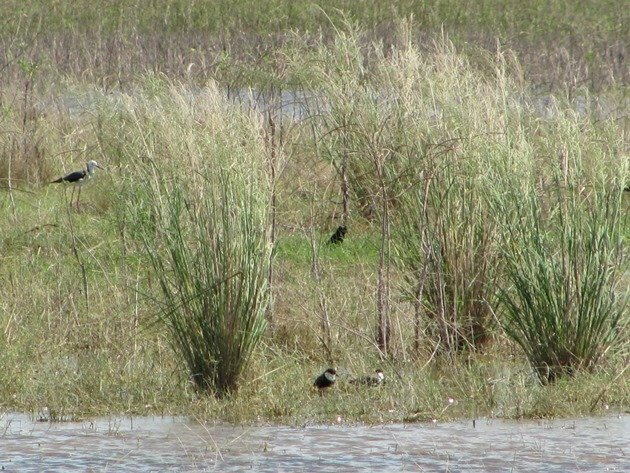 The birds may arrive through marine traffic or wander beyond their normal range, but with very few people with the knowledge to identify these invasive species there may be more that get overlooked. One Common Starling that made its way to an area to the south of Broome last year was subsequently dealt with by the property owner. Although it appeared to be travelling alone you can never be entirely sure in such a wide open area, though it definitely was not part of the familiar large flocks that you see in the east of Australia. 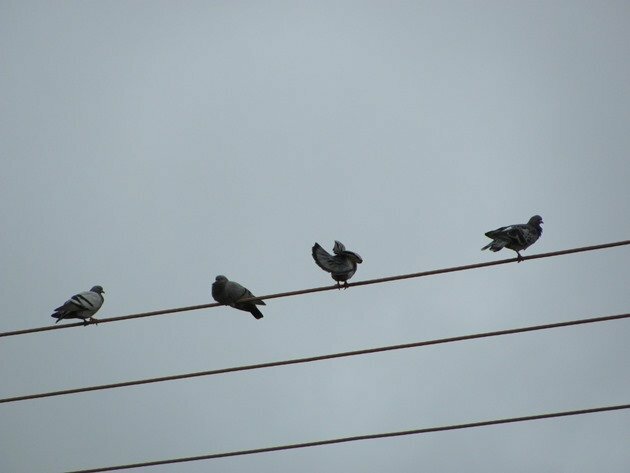 On another occasion in 2012 we had four Rock Doves on a power line in town. There are no Feral Pigeons/Rock Doves in the Broome area and these invasive species are mainly found in the cities of the south. 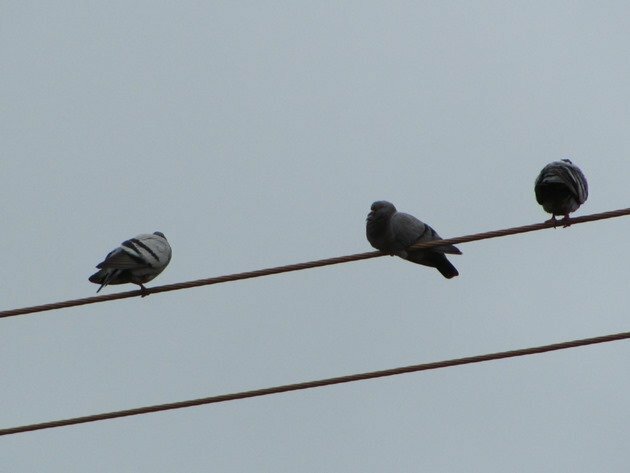 They also descended from the European Rock Pigeon and have adapted well to city life. They are also bred for racing around the world and once these four Rock Doves were captured it was discovered that they were in fact birds with tattoos on their wings from somewhere in Asia and were subsequently destroyed. There is a huge risk of disease coming into Australia and the government does not take risks. 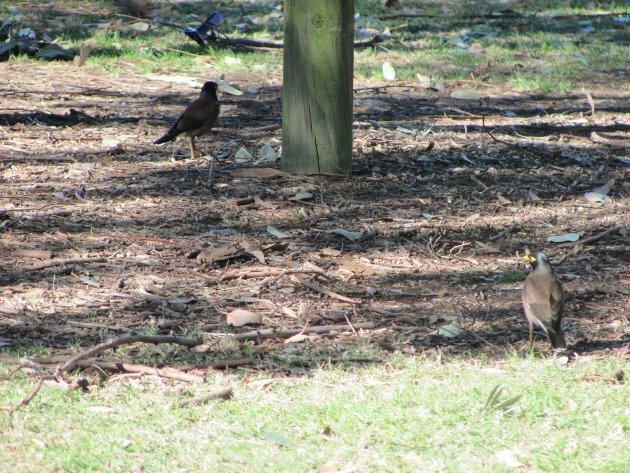 On our recent visit to New South Wales we noted that many of the native species of birds have been displaced due to the highly invasive Indian or Common Myna. These birds were introduced to Australia between 1862 and 1872 and there is a known release of 42 birds in Melbourne in 1863 and a further release in 1883 in the cane growing area of Northern Queensland. From a release of one hundred birds in Canberra in 1968 there are now more than one hundred per square kilometre and they are a serious threat. It was believed that the species would help with the eradication of acne beetles and locusts and now they have the honour of being on the top one hundred list of invasive species by the IUCN/SCC Invasive Species Specialist Group. They are an aggressive species and soon take over from the native birds as they compete for nest sites. It is important to not mistake this species for the Noisy Miner, which is a native bird of Australia and often inhabits the same areas. One of the biggest threats in Broome at the moment is the arrival of the Cane Toad. Its arrival is imminent and there is little that can be done to control it. 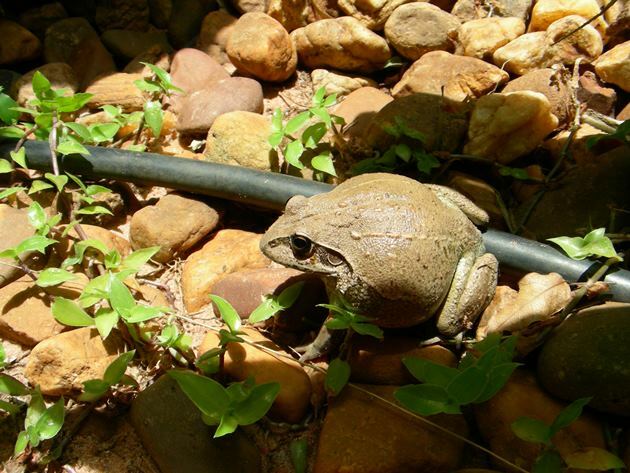 It has crossed the border from the Northern Territory in recent years and the spread of the Cane Toad is as a result of a release of a few Cane Toads in 1935 to Queensland from Hawaii in the hope of controlling cane beetles. Sadly, they did not eradicate the cane beetles and by 1978 they had arrived in New South Wales and by 1984 they had arrived in the Northern Territory. With flooding rains across the north of Australia each year the Cane Toads are able to spread rapidly and despite all of the efforts by volunteers very little can be done to stop their spread. The best solution at the moment to prevent native animals from eating the Cane Toads and subsequently dying is to train them to understand the consumption of the Cane Toad will make them sick. Scientists have been able to produce food with a small amount of the toxin in and once a native animal has been sick as a result of eating the toxin it learns to not eat it again. It is hoped that this information will be passed through generations of native animals and they will then choose to not eat Cane Toads and therefore survive. One risk of the removal of Cane Toads from the native bush is that we do have a similar looking native species. The Giant Frog Cyclorana Australis is a large burrowing ground frog and as an adult can look very similar to a Cane Toad. 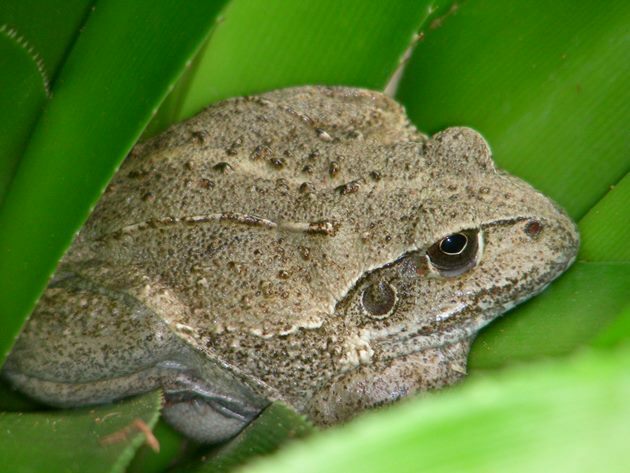 Its main difference is that it does not have the prominent brow ridges and as a young frog it is quite beautiful and not likely to be mistaken for a Cane Toad. It pays to be very careful before you consider the destruction of what you believe to be a Cane Toad in the north of Australia where these Giant Frogs live. Giant Frog-NOT a Cane Toad! 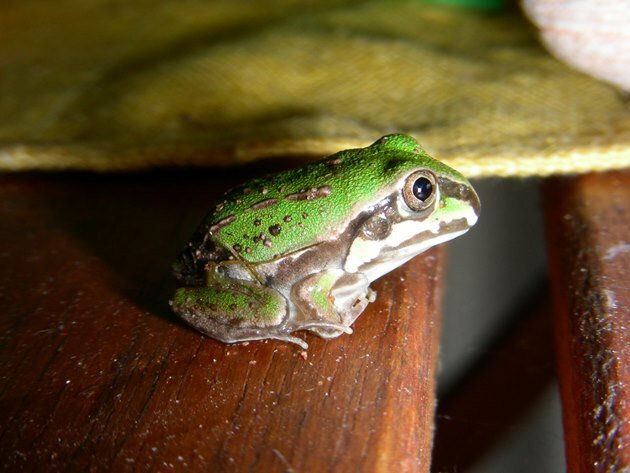 Australia has more invasive species than people without a doubt and we are all faced with challenges in a mostly harsh environment that most of the invasive species have adapted to very well. You could argue that most of these invasive species have adapted a lot better than the first European Settlers who have clung to the coast in the southern states. There are challenges ahead for all of our native species. It can only be hoped that we do not lose any more of our native species as a result of the invasive species that have been introduced over the years and learn from those mistakes. Clare, thank you so much for this fascinating and thorough report. I’ve been to Australia twice, and hadn’t heard of most of what you’ve told here. I like that you emphasized the difference between the Giant Frogs and the Cane Toads. I always worry that Giant Frogs may be accidentally destroyed when people think they are Cane Toads, because they are so similar and hope this may make people more aware.